The University of Texas is involved in the one of the largest oil and gas operations in America. UT doesn't require companies who lease its land to use available technology to cut methane pollution. So we're calling on UT Chancellor Milliken to require these companies to cut their pollution in half within 5 years. We must change our dirty energy habits to combat the threat of global warming and ultimately move to 100% clean energy. The UT community understands this principle and prides itself on leading the way towards the clean, sustainable energy future we need. But when it comes to controlling pollution that contributes to climate change from fracking operations on its own land, UT’s approach is stuck in the past. At the more than 9000 wells drilled on land owned by UT, methane comes to the surface with recovered oil and leaks into the atmosphere. Invisible and odorless, methane is an incredibly powerful greenhouse gas — more than 80 times more powerful at trapping heat than carbon dioxide. Scientists claim that 25% of the global warming we’re experiencing today is due to methane. 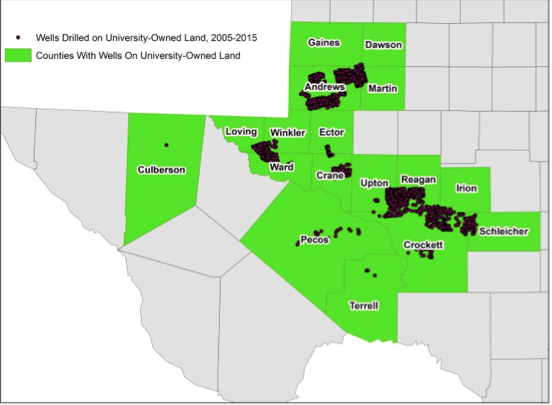 Environment Texas analysis shows that the equivalent of 11.7 million metric tons of carbon dioxide leaked from UT land over a six year period in the form of methane. That’s the same climate impact as about 2.5 million cars. Simple and affordable modifications to oilfield operations can cut methane emissions dramatically. Other oil and gas states, like Colorado, California and Wyoming have started requiring companies to implement these strategies to reduce emissions, but companies that drill on UT land aren’t required to make them. According to ICF International “...industry could cut methane emissions by 40% below projected 2018 levels at an average annual cost of less than one cent on average per thousand cubic feet of produced natural gas by adopting available emissions-control technologies and operating practices. All we need is for UT to live up to its words and act to reduce this harmful pollution. So please join us. Global warming is a profound threat to virtually every aspect of nature and human civilization –disrupting the functioning of ecosystems, increasing the frequency and violence of extreme weather, and ultimately jeopardizing health, food production, and water resources for Americans and people across the planet. As one of the biggest players in the oil industry in the country, UT has a platform by which they can drive powerful change in the industry. Not only will they clean up their act, they’ll create a powerful precedent which could reverberate throughout the industry. Plus it’ll help make UT a national leader in sustainability. Learn more from our video on our Facebook page. Don’t buy claims that oil and gas wastewater is clean. Fracking wastewater contains highly toxic substances that can persist in the environment for many years. It can potentially contain any combination of over 1600 different chemicals. In one analysis of fracking fluid chemicals, 157 were found to be linked to reproductive or developmental health problems, and toxicity information was lacking for hundreds of others. Naturally occurring underground chemicals include oil byproducts, which can cause kidney and liver damage and reproductive problems, and radioactive materials, which can cause lung and bone cancer, lymphoma and leukemia. I want to talk about the environmental risks posed by oil and gas wastewater, the opportunity to recycle the wastewater for reuse in the oilfields, and the danger of reusing it for other purposes such as agriculture or discharge into our waterways. The Center for Biological Diversity, Clean Water Action, Environment Texas, and Sierra Club hereby file this protest of Bureau of Land Management’s (BLM) proposed December 5-6, 2018 Competitive Oil and Gas Lease Sale, and Environmental Assessment (EA) DOI-BLM-NM040-2018-0060-EA, pursuant to 43 C.F.R. § 3120.1-3. We formally protest the inclusion of each of the following parcels, including approximately 4,200 acres underlying Choke Canyon Reservoir in McMullen and Live Oak counties in Texas, and over 400 acres in Oklahoma’s Alfalfa, Custer, Dewey, Ellis, Harper, and Woods counties. There are more than 9,000 wells on land owned by UT, from which methane comes to the surface with recovered oil and leaks into the atmosphere. Methane traps more than 80 times more heat than carbon dioxide. 25% of the global warming we’re experiencing today is due to methane. The equivalent of up to 11.7 million metric tons of carbon dioxide leaks from UT land every year in the form of methane.